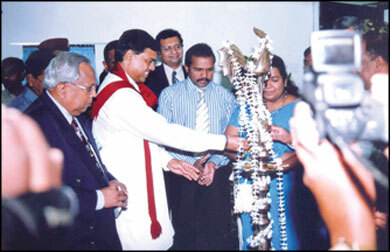 Senior Advisor to the President and Member of Parliament, Basil Rajapaksa lights the oil lamp at the commencement of the Batticaloa branch of Lankaputhra Development Bank. Minister of National Integration and Reconciliation Vinayagamoorthy Muralitharan, Mayor of Batticaloa Mrs. Sivageetha Prabaharan, Chairman of the Bank A. Sarath de Silva and General Manager/Chief Executive Officer Ravi Dassanayake are looking on. Sri Lanka State Trading (Miscellaneous) Corporation has signed a memorandum of understanding with TVS Lanka (Pvt) Ltd under the patronage of Trade, Marketing Development, Cooperatives and Consumer Affairs Minister, Bandula Gunawardene recently. Under the MoU, the TVS Lanka (Pvt) Ltd has been appointed authorised agent for the supply of motor cycles to government departments at reasonable prices. The Board of Investment of Sri Lanka granted investment approval for four companies for investments worth US $ 68 million. Chairman / Director General signed the agreements on behalf of the BOI and formally presented the BOI Certificate of Registration to the investors. Two investment agreements worth US $ 37 million were signed with Vidatamunai Wind Power (Private) Limited and Seguwantivu Wind Power (Private) Limited. The companies will set up two wind power plants at Vidatamunai and Seguwantivu in Puttalam respectively. Akbar Brothers, Hirdaramani Group and Debug Computers are the main promoters of the venture. The United States-Sri Lanka Fulbright Commission held a two-day workshop on sub-editing and creative writing for journalists from August 6-7 at the Commission auditorium. John R. Stifler, Senior Lecturer and Writing Course Coordinator of the University of Massachusetts was the facilitator of the training program. Participants said, the course was fruitful and keenly looked forward for many such programs that will help improve the writing, editing and the overall standard of journalism in the country. The Monetary Board, at its meeting held on 10/08/2009 has promoted six Staff Class Grade IV officers, P.N. Weerasinghe, Mrs. J.P. Mampitiya, Mr. W.M. Karunaratne, Mrs. P Liyanage, Mr. B.D.W.A. Silva and Mrs. C.K. Nanayakkara to the post of Assistant Governor with effect from August 10th, 2009. These promotions have been made in line with the succession plan of the Bank and to address the new challenges of the Central Bank.